Oeksound’s Soothe EQ has found a place in the hearts of many producers, but can its latest processor win us over? Compressors are great. Who doesn’t love a good compressor for controlling dynamics? However, when it comes to controlling transients, they’re no longer the best tool for the job, as transient shapers have taken that crown. Although these types of processor have been around for a while, it’s only in recent years that we’re seeing forward-thinking developers pushing the boundaries of what can be achieved with transient control plug-ins. Based in Helsinki, Oeksound follows up its fantastic Soothe plug-in with Spiff, an adaptive transient processor that analyses and targets only the transient part of the signal, allowing you to cut and boost your transients with extreme detail. Brushing over the slightly odd name, Spiff is available in VST, AU and AAX formats and requires an iLok account to register, although thankfully, dongle-free iLok licensing is available. On first appearance, it bears many resemblances to Soothe, with controls on the left and a large section on the right that functions as a sidechain EQ, and also an OpenGL-accelerated graph to show where the processing is being applied. There are five bands, including an HP, LP and three parametric bands, and each has several slopes and shapes available to choose from. Like Soothe, you add boosts for regions you want to have more processing, and cuts for regions you want to leave alone. There’s also a Band Listen function that solos the band and monitors the delta signal, allowing you to hone in very specifically on certain parts of the spectrum and signal. In fact, there’s an overall Delta button and it’s recommended that you use this feature to help you get to grips with Spiff’s other controls, as it lets you hear exactly what parts of the signal the processor is actually targeting while bypassing the dry. The Depth dial controls the main effect amount, working on all parts of the signal no matter how loud, as it’s not based on threshold. To further refine your selection, there’s a Sensitivity dial that sets whether it reacts just to hard transients, or also includes softer hits, and a Sharpness control, which is essentially like a Q value. Lower Sharpness values do wider cuts or boosts, resulting in more traditional transient shaping. The higher values target more narrow bands, which can work well on harmonically rich-type material, such as pianos. Finally, control wise, there’s a Decay dial that acts like a recovery time, and a Decay LF/HF control, which allows you to weight whether you want the lower or higher frequencies to take longer to recover, depending on whether the control is turned to the left or the right. With the Delta function engaged, you can quickly start to get a feel for how all of these controls interact alongside the sidechain filter, and you can hone in on specific elements like sharp, high clicks, or rounder low-mid percussive bumps. You can then choose whether you want to cut or boost with two buttons at the top, disengage Delta, and then tune the depth control to taste. 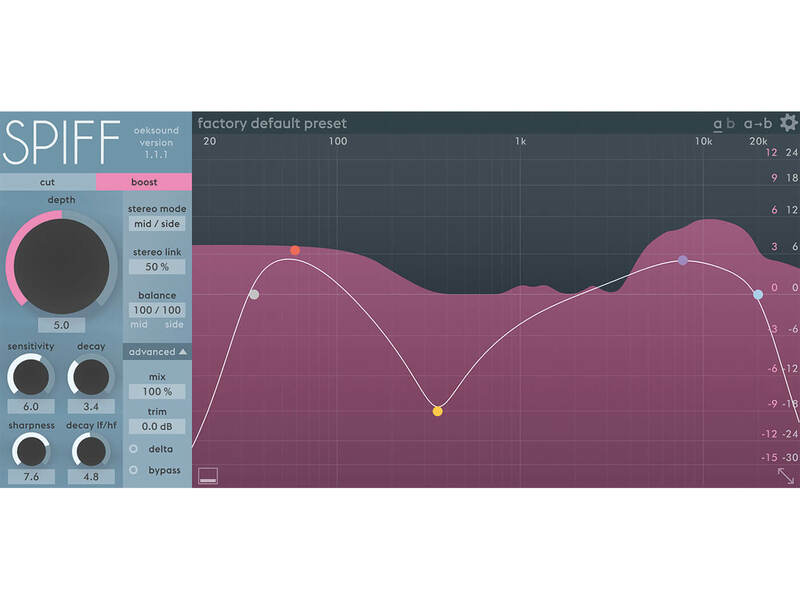 Spiff was initially designed to control clicks, pops and vocal mouth noises, but it’s applications go way beyond just that, and there are a bunch of useful presets to get you started. You could, for example, soften the attack on any sound to help push it back in the mix, add powerful punch to drums or body to a sound without adding boominess, or even target and fatten the thud of a kick drum in a full mix. I experiment with a full-sounding drum loop, and tweak the Decay dial while in Boost mode with Delta engaged, which results in an incredibly natural-sounding, gated beat. As there are some clicks, I follow this up with a second instance of Spiff set to target and cut just the sharp, high-frequency transients. When placed alongside iZotope’s Neutron 2, my current transient plug-in of choice, Spiff performs admirably, with a more finessed and targeted sound that’s able to catch sharper and faster clicks than Neutron’s Transient Shaper module. One of the other, pleasant side-effects of using Spiff on a variety of material is the subtle smoothing effect it has. With a particularly uneven percussion part that has some quite sharp transients in it, Spiff somehow manages to clean up the sharpness of the bad bits, while leaving the rest relatively untouched. In this way, we can start to see and appreciate the similarities with this and Soothe. Both plug-ins can be used to dynamically target very specific parts of a sound and bring them under control, although Spiff can, of course, also be used to add extra targeted punch and character. One of the costs of having such fine control over how and where to boost or cut is that you can’t do both at the same time. 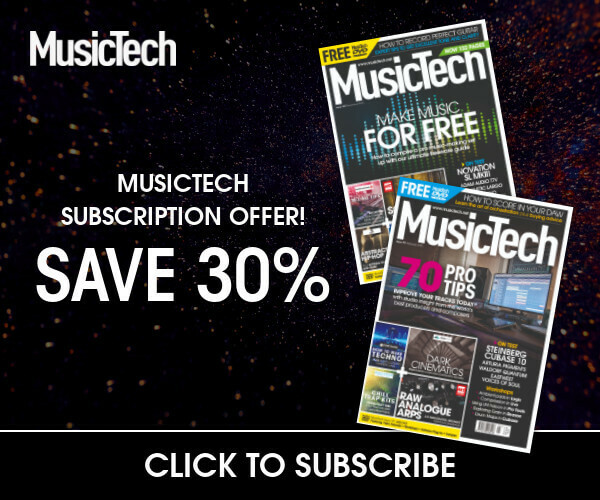 There are other, more traditional transient plug-ins that give the option to boost or attenuate the attack and sustain portions of different parts of the spectrum from a single interface. After spending a bit of time with Spiff, though, you start to realise what a blunt instrument those plug-ins are. Yes, they’re effective, but there are often times when they’re not doing 100 per cent exactly what you wanted, whereas Spiff gives you much more targeted control. In an ideal world, it would be nice if you could choose whether to boost or cut each of the five bands and also control the decay amount on a per-band basis, so you could target specific drums or instrument frequencies. However, I suspect this would make things exponentially more complicated and CPU intensive so, for now, I’ll settle for using a couple of instances, if the need arises. Speaking of CPU, Spiff isn’t too intensive on the processor as long as you keep the quality on Normal for most of your processing tasks. There are additional quality settings available and, somewhat unsurprisingly, opting for the Ultra setting at 4x oversampling creates a dramatic increase in load, and should probably be saved for mastering purposes or for your bouncedowns. To give additional flexibility, there’s a choice of Minimum and Linear Phase, a Window setting that lets you prioritise shorter timing, or longer frequencies; Left/Right or Mid/Side modes, a Mix dial for parallel processing, and a Trim to help balance the final output volume. Initially, Spiff may appear a little daunting compared to some other transient plug-ins, but it doesn’t take too long to get to grips with it and the finely tuned algorithm makes it surprisingly easy to get good-sounding results that can refine your mix. It’s also much more versatile than a simple transient shaper, and we’ll likely be finding interesting new ways to use it for sound design for some time to come. As with Soothe, it’s a well-designed, cutting-edge tool with deep control and transparent-sounding results that could easily find a unique place in your plug-in library. I have several transient-shaper plug-ins that I use, and often end up turning to Logic’s unsung hero, the Enveloper, for quick results on percussive parts. However, when you listen close, you can often hear unwanted subtleties in the processing, which can be hard to disguise when used on more prominent sounds. If you’re a mix engineer working on raw audio, that strives for the best possible sound and likes to hunt down clicks and peaks, then Spiff will likely become your new favourite weapon. As with Oeksound’s Soothe, it has a pleasing, rounding effect on the audio that just makes it nicer to listen to. It will also give you an additional, more transparent tool for boosting certain regions that can be used in place of EQ. 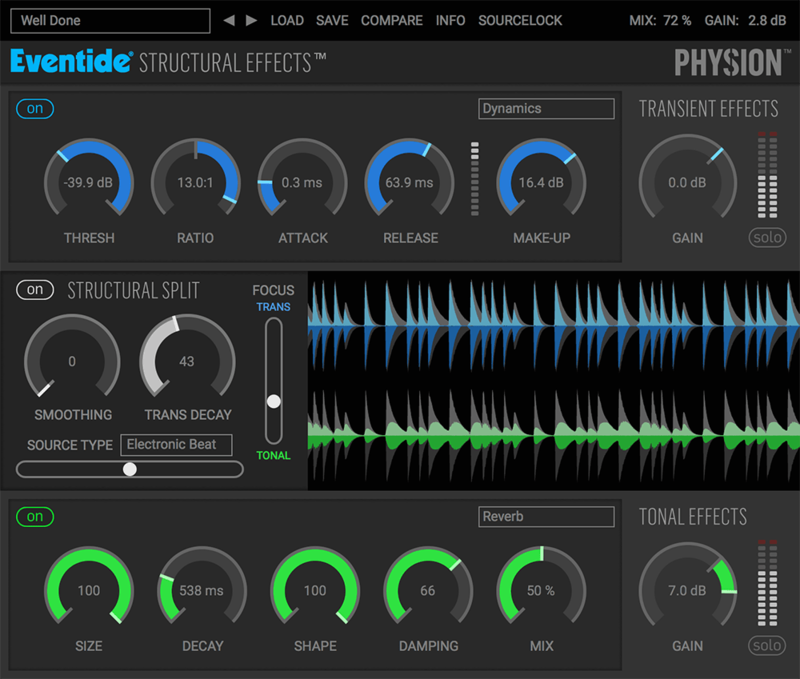 Physion uses Eventide’s new Structural Effects technology to separate out the transient and tonal parts of a signal. You then increase or reduce each and apply a range of effects, making it more creative, but perhaps not as good for transient control. 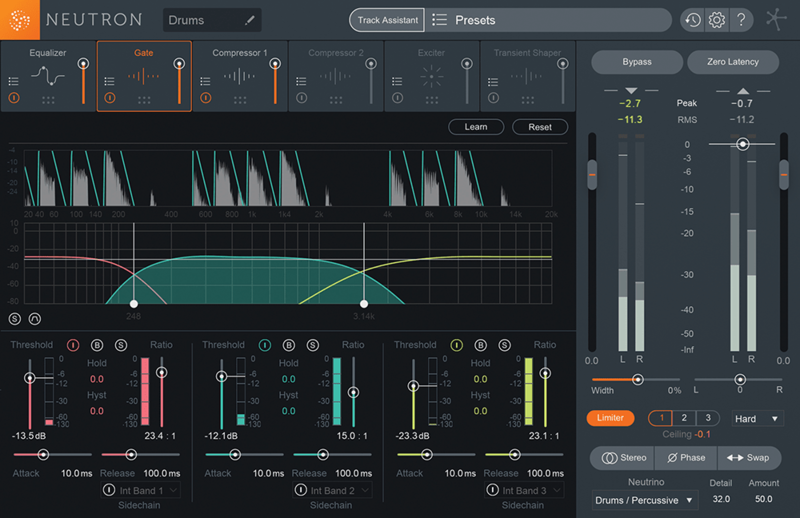 Neutron 2’s Transient Shaper module features three bands and several slopes and algorithms for boosting and cutting transients. It’s quick and powerful, and you get a bunch of other modules and features, but it can’t match the finesse of Spiff. It’s another winner from Oeksound. A versatile, effective transient processor that you won’t know you need until you try it, and then you won’t be able to go back!